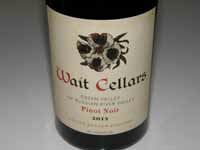 Limited production Pinot Noir and Chardonnay by Robert Wait, owner of The Page on Divisadero Street in San Francisco. Founded in 2005, the wines are crafted at Bluxome Street Winery in San Francisco's SOMA district. Much of fruit comes from Devoto Gardens in Sebastopol while a small plot is being developed in the Petaluma Gap. Bob is in the winemakers program at UC Davis. 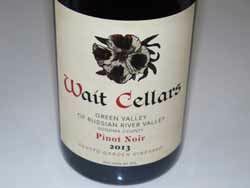 Bob's brother, David, carves the woodcuts featured on all Wait Cellars labels.